I paint in public settings. 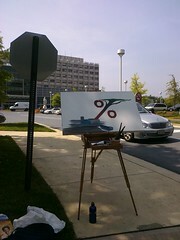 Sometimes, I set up my easel on a busy sidewalk in front of a hospital and begin to analyze patient care using cadmium red. Or I create a beautiful and tragic painting on the back of a business jacket then ask my dear friends to wear these jackets in a room filled with traditional “suits.” I ask them to go where they do not belong. I tend to embrace outsider art. I tend to appreciate the work of those without formal training who paint because they must. There is a spirit and a drive within their work that is not easily surpassed by technical mastery of the form. I tend to love to see art in unusual places and artists where they do not belong. This past March, I recited poetry at Bus Boys and Poets during a celebration of healthcare reform. The room was filled with activists, musicians, and poets. There was quite a stir when an entourage of well-dressed figures entered the room and sat on the front row. I recited my poem “Wheals on the Bus". I spoke of riots and rights and data access. I spoke of Martin Luther and Martin Luther King Jr. I spoke of Rosa Parks in relation to healthcare reform. It was a powerful poem. As I stepped off the stage I stood in front of the reason for the entourage. Rep. John Conyers, Jr. (D-MI) stood up clapping and held my hand and thanked me for the poem. A congressman stood within a sea of artists, and we welcomed him. This week I saw congressman Conyers again. He was asking the comedian Stephen Colbert to excuse himself from a Capitol hearing and submit his testimony into the record. This was too serious a proceeding for a comedian to take part in. He would only distract from the real purpose of the day or perhaps he was only there to promote his show or his march. He did not belong. I suppose in 1981 there were people who thought Jack Klugman did not belong on Capitol Hill, either. Jack was the lead actor on a very popular show called Quincy, M.E. He was only an actor portraying a doctor, but he had come to speak about orphan drugs. The room was packed with reporters and cameras as Klugman spoke, and his appearance that day is part of the reason the Orphan Drug Act was passed. The other part was the patients. The room was filled with children and adults all suffering from the effects of their rare diseases. I am so glad an actor and a large group of patients came together in common cause to help those who suffered so. I am sure that day seemed as much a three-ring circus as the recent Colbert appearance. I will be painting at a conference soon. I will have my easel near the stage and paint and live tweet, and perhaps, I too will seem to be a circus act. On Tuesday the 28th and Wednesday the 29th of September I will be in Philadelphia. I will be attending the E-Patients Connections 2010 Conference. I will be speaking at the conference about patients’ rights, special education, and participatory medicine. I will be one in many. There are many amazing people working toward positive medical outcomes attending this conference. Looking through the speakers list I see CEO’s, doctors, HIT designers, Pharma reps, and individuals involved in government. I also was pleased to see a poet and an actor. Perhaps things are becoming more inclusive. 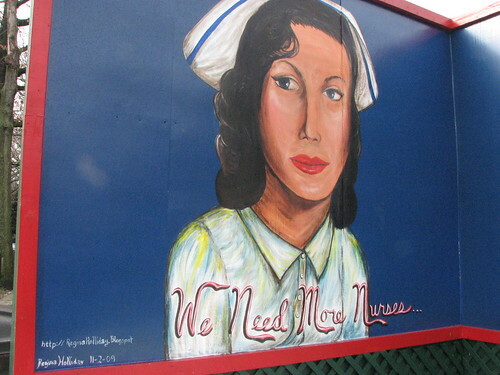 Perhaps there are fewer off-limit venues for patients and artists. On Wednesday, I will speak in the morning. At the end of my speech, we will auction off the work I painted on site. It will be a three-panel piece explaining the current role of patients within HIT and the vision of what that relationship could become. I will use the metaphor of a child on the playground to visualize this complex subject. It should be amazing. We will live tweet the event, and people can bid online with the hashtag #ePatCon. All proceeds will go to Ivymount School. This is a non-public school that focuses on helping children with autism. Whether an artist paints at a conference, or an actor speaks on Capitol Hill, it is important to being willing to step outside the comfort zone. This is a good thing for people and patients to understand. Do not let anyone tell you that you do not belong. When you present the testimony of your health history don’t excuse yourself from taking part in the ongoing discussion. 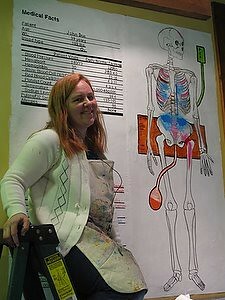 When I was painting in preparation for the gallery show in July, I was in pain. I had smashed my finger in a ladder, and it was swollen with the under-nail blackened with blood. 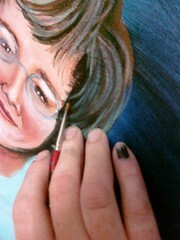 As I painted, I thought of how much my finger resembled a zombie’s finger. Gradually painting, with each stroke of the brush a kind of agony, I remembered zombies used to be slow. My husband Fred and I often talked about this phenomenon. We had grown up with films like Romero’s Night of the Living Dead. Zombies would stumble and walk slowly, groaning as they came. Even an out-of-shape store clerk like Shaun, from Shaun of the Dead, could outrun a zombie. The terror aspect of zombies resided in their unstoppable nature. Zombies did not sleep, they did not stop, and they were everywhere. These are the type of zombies depicted in the 2006 book World War Z by Max Brooks. This book was a follow-up to the very popular Zombie Survival Guide of 2003. The Zombie Survival Guide itself addressed a pop-culture meme of its time. In 1999 The Worst-Case Scenario Survival Handbook by Joshua Piven and David Borgenicht was published. In the series of books that followed the authors explained how to save one’s self in extreme situations such as crocodile-infested waters or quicksand. In bars and at parties throughout America we took it a step further and asked all of our friends what their zombie survival plan was. In my age demographic, and I am 38 mind you, I have never met a person who did not have a zombie survival plan when asked to provide one. Whilst this zeitgeist hobbled along, director Danny Boyle and screenwriter Alex Garland were creating 28 Days Later, released in 2002. In 28 Days Later, zombies ran. Purists will say the zombies in 28 Days Later are only humans infected with a virus, but it opened the floodgates. From the Dawn of the Dead remake of 2004 to Zombieland of 2009, zombies now would sprint toward their victims, tearing them to shreds in moments. We are rapidly approaching the ten-year anniversary of fast zombies, and I think this change in zombie behavior in media is a reflection of the culture of our times. This is only the most recent example of our continuing denial of the image of death within our culture. We can deal with a frantic moving creature trying desperately to live, but many cannot accept the vision of the slow decent towards death. When I visited Fred’s mother and father for the first time in the spring of 1993, I loved their charming home and was surprised to see a vestige of an older time within their walls. The Holliday house had a formal parlor. The parlor was furnished with imitation Chippendale pieces and matching lamps in a Victorian style. The space was usually dark and serene, a place apart from the busyness of the kitchen and other rooms. Once upon a time in America, everyone who had a decent-sized home would have had a formal parlor. This space had the best furnishings and art, and it was the room in which the recently deceased would be laid out for presentation before funeral. After the Civil War, families began giving over burying responsibilities to an outside business called a funeral parlor. With this change in the way Americans dealt with the transaction of death, formal parlors were replaced with living rooms, and Americans began to distance themselves from the realities of death. Another vestige of this time that is rarely seen today is postmortem photography. I vividly remember going through a tin of old photographs as a child. I remember holding up a picture of a “sleeping” baby and asking my mother who the child was. Even at six years of age, I can remember feeling something was not quite right within the image. My mother paused and then told me it was the dead sibling of my father. The child had not lived long enough for a picture of it while living so they had a portrait taken after the child had died. I remember holding onto that picture for what seemed like an eternity. Although I placed it back in the tin 32 years ago, I can still see that baby in my mind. Years later when Fred met my family, he held my hand as he patiently looked through years of family scrapbooks and photograph albums. After viewing a few albums, he was surprised and a little disgusted to see we took pictures of the dead. In our albums he saw my aunts and uncles and distant cousins all arrayed with their funeral finery. In 2001, one year before the fast zombie would make its debut in the world of film, I stood beside my husband as I took a picture of my dead father in his casket. Fred whispered in my ear, “Do not take a picture of me in my casket after I die.” I respected Fred's wishes and when my Fred died, I did not take his picture. I did not have to. That image is seared within my mind. But I also respect the wishes of all those families who take pictures of the love ones who have died. Every now and then I see them in my Facebook and mourn with these families. I recently read Atul Gawande’s piece in The New Yorker, Letting Go: What should medicine do when it can’t save your life. I was struck once again with the extreme discomfort most doctors have for discussions about end of life care with their patients. In our cancer journey, Fred and I often had to deal with the inability of Fred’s doctors to talk about the reality of palliative care and hospice as an option. In the emotional roller-coaster of potential treatment and curative care, we were left without a very good understanding of the benefits of a palliative course. After Fred was no longer eating or drinking and was in extreme pain, this direction was suggested, and Fred signed the appropriate paperwork. When we transported Fred to the hospice facility, both the EMT transport team and myself thought he might only have days left to live. So why do people resist the concept of hospice and palliative care when it has shown such ability provide a better quality of life, and in so doing, perhaps even extend life? Why do all of those friends of mine have a well thought-out zombie survival plan but have never considered filling out an advance directive? Why do we resist the reality of death as a part of life? I know exactly how horrible those groaning breaths sound. I heard Fred make them for hours as he tried to breathe at the end of his life. But I heard them before in a pop culture world that tried to make sense of the senseless. Recently, I was invited to attend the Medstar CMIO (Chief Medical Informatics Officer) boot camp by Trenor Williams, MD, CEO and co-founder of Clinovations and Gerard Burns, MD CMIO at MedStar. Dr. Burns had seen me speak on July 13 at HHS upon the announcement of Meaningful Use. He had thought I would be an excellent guest speaker (In my youth, I spent six weeks at Navy boot camp, and this was much nicer.). It was a conference held at the Doubletree in Columbia, MD. It was a calm, low-key event. I passed by a pool filled with families enjoying an end of summer swim as I entered in the mid-sized meeting room. I was very happy to be invited, and I thanked both the folks from MedStar and Clinovations. In the weeks prior to the event, I researched several terms and acronyms we would be speaking about. Jeremy Wong, also from Clinovations, asked me to consider any articles I would like to include regarding “how patients feel they have been directly affected by something that occurred when their doctor used CPOE or clinical decision support.” Hmm… Well first I had to find out what CPOE and (CDS) clinical decision support meant. CPOE is Computerized Physician Order Entry and is a very large aspect within the EMR and Meaningful Use. I don’t think many patients are talking CPOE. I did a search and found quite a few HIT (Health Information Technology) venders promoting the positive outcomes of CPOE adoption. I found the government encouraging certification of systems and patients advocacy groups concerned about potential deaths due to computer error. Where were the e-Patients in this conversation? I couldn’t find any reports or blogs from a patient perspective discussing CPOE. As it was with CPOE, so it went clinical decision support. Clinical Decision Support Systems are computer programs that assist physicians in the decision-making process during diagnosis utilizing patient data. I could find virtually nothing written from the patient perspective on this subject. In researching patient involvement within these two terms, I felt like I was hitting my head against a wall. Physicians and hospitals were having a party, and they didn’t invite the patients to the gala event. So my mind began to search within and thought of gothic horror. Instead of CPOE, why not see: Poe. (Edgar Allan Poe, that is.) That thought brought me right back to my 10th grade English class and The Mask of the Red Death. I knew what I would speak about at CMIO boot camp: Meaningful Use/patient access and The Mask of the Red Death. On the way to the event my friend Dr. Ted Eytan and I had such a wonderful conversation in his zip car. He answered the final question I had. “How do you pronounce CPOE? As in "C.P.O.E. ", or is it "see Poe"? I can’t find the pronunciation online.” Keeping his eyes on the road and smiling, he said that it was cute that I didn’t know how to say it. CPOE is pronounced. C.P.O.E. We laughed together as a doctor and a patient and went on with the drive. Around noon, I was introduced as the guest speaker by three doctors: Dr. Gerard Burns, Dr. Trenor Williams and Dr. Ted Eytan. I was quite the special guest by the time I spoke. I decided I would inform the room of my ignorance of the correct pronunciation of CPOE. I could have just pretended prior knowledge, but instead I thought I should make it clear how little patients use these terms. I find great problems persist within the doctor/patient relationship when we smile and nod pretending to understand. So I admitted my ignorance of the correct pronunciation. I was surprised when the audience responded that both were right; it depended on the hospital. I told them great, because when I think of CPOE, I think of Edgar Allan Poe. I then asked how many in the audience had read The Mask of the Red Death? Three people raised their hands out of 40. I was really feeling like a special guest speaker at that point. I had been married to a man who had a doctorate in film studies with an emphasis in television. We had often talked about special guests. In television, the special guest is sometimes a celebrity, but is always a performer outside of the regular cast. They do not belong. Often their insertion into the plot indicates the moment a television show has jumped the shark and fallen into the world of the absurd. Well, I could ignore the vision of my speech, or I could begin a dramatic recitation of The Mask of the Red Death. Have I ever mentioned that I was Oklahoma State Champion of Poetry Recitation in 1991? I decided to perform a tale of gothic horror. "A prince invites the members of the aristocracy to masquerade ball at his abbey where they weld the doors shut as a plague called the Red Death blankets the land. As the partygoers enjoy the festivities flitting back and forth through six brightly colored rooms, a clock chimes on the hour, and silence falls each time. As the party continues, a figure costumed as a corpse appears. The prince takes such a costume as an affront and confronts the ghastly guest in the final seventh room drenched in the color black with red light streaming in. Upon facing the figure the prince dies and the party attendees soon find the guest wears no costume: the Red Death has walked among them." It is powerful reading, don’t you think? It also functions as a very apt cautionary tale when you consider the way the CPOE is utilized in hospitals. Why can’t I find the patient perspective on CPOE? We have not been invited to the ball. Where is the patient information entry aspect to be used in conjunction with the physician’s input? As the Meaningful Use rule points out, patient access is the core element in the functionality of a viable EMR (Electronic Medical Record.) While researching, I was deeply offended by the jovial comments about “sweet stimulus cash” that I saw posted on many HIT pages. Too many companies view ARRA and HITECH as a party they can attend while death walks the land. Locked up in ivory towers or data silos, too many members of the medical establishment are locking themselves away and closing the venues for communication. I did not see patient access to the EMR addressed within his answer. I was a widow fresh from the graveside asking questions that affect the lives of us all. I was not supposed to be there. They were having a ball and I was Death walking among them. The CMIO speech lasted about thirty minutes. After the speech we had a very nice lunch. They were happy to see that I wanted to stay for some of the after-lunch sessions. I got to hear quite a bit more about CDS, EMR’s and Meaningful Use. I heard quite a few folks mention they used Cerner systems. My ears perked up, as I had attended the Meaningful Use Summit at Cerner in June and had gone through their virtual tour of the Cerner EMR system. As the folks from MedStar began discussing the subject of making the EMR more patient-centric, I mentioned in the open Q&A that Cerner’s system could allow for a visual avatar to be incorporated to the functionality of EMR. An avatar, be it an actual photo of the patient or an image chosen by the patient, is very important in creating greater visual memory. I further added, “Why do you think Facebook and Twitter are so successful? They do not take our faces away.” One of the CMIO’s responded that that function had been turned off within their system.